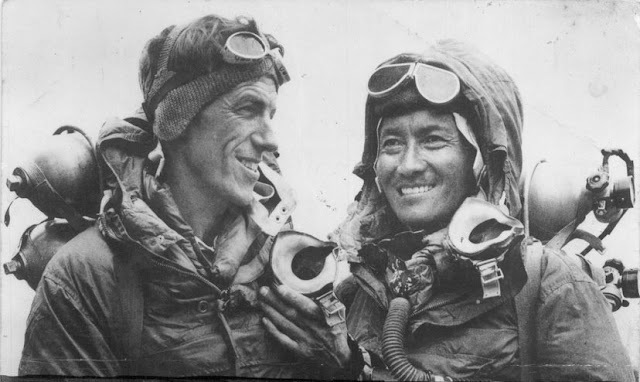 29-May-1953 : Mount Everest conquered by Edmund Hillary and Tensing Norgay. By today's standards, the 1953 British expedition, under the military-style leadership of Sir John Hunt, was massive in the extreme, but in an oddly bottom-heavy way: 350 porters, 20 Sherpas, and tons of supplies to support a forefront of only ten climbers. "Our climbers were all chosen as potential submitters," recalls George Band, 73, who was one of the mob. Fifty years later, Band's memory of the campaign remains undimmed. "The basic plan was for two summit attempts, each by a pair of climbers, with a possible third assault if necessary. On such expeditions, the leader tends to designate the summit pairs quite late during the expedition, when he sees how everybody is performing." Anxiety over who is chosen for the summit team would be a trademark of major Everest expeditions for decades to come. But never again would the stakes be quite so high. By the spring of 1953, the ascent of the world's highest mountain was beginning to seem determined. First attempted in 1921 by the British, Everest had repelled at least ten major expeditions and two irrational solo attempts. With the 1950 discovery of a southern approach to the mountain in newly opened Nepal, and the first ascent of the treacherous Khumbu Icefall the following year, what would come to be known by the 1990s as the "yellow brick road" to the summit had been identified?